Combat rules at the German Flatlands 2014! 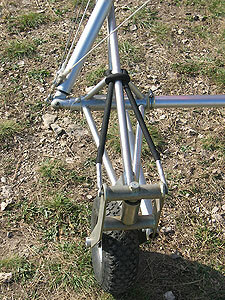 For some years we were asked by our dealers to build a modern tandem glider. We worked a lot with the first prototype but it was not really what we longing for. After a brake for reflections we start from the very beginning a completely new design and achieved success. The Target 21 will enable you to perform your tandem flights easier than ever. Here are some items from impressions of our Swiss friends, the tandem instructors; they helped us a lot with the final tunings. -Take off without problems. Really easy! The handling is very round and soft. It is very ok to fly with a lot of traffic in the air and close to the relief. -I was surprised how easy this glider is to fly with just one pilot. 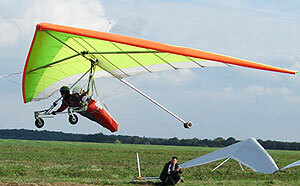 -We felt, that this glider has really more performance compare to other tandem wings. It's more flying. -I compared all flights on the computer and I saw, that the glide ratio is better with two people. Just the minimum sinkrate is a little bit higher 1-1,1m/sec. -The A-frame is stiff, the sail is strong. Very good to make more than 1000 flights. -The control frame size is perfect! When we fly together we have enough place to fly very comfortable. -After all these take offs we can say, that the take-off characteristic is easier than with other tandem gliders. -We took a thermal with a single paraglider and we had no problem to climb up with this pilot. We changed the commanding during circling and at no time we had any problems to climb up very well. 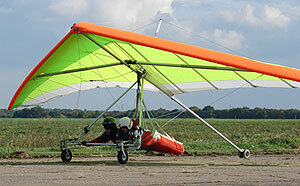 The glider is very stable in the turns and he takes the thermals very nicely and directly. Really cool!! -Stall in the turns with this speedbar position is not really possible. -We like the different handling style. 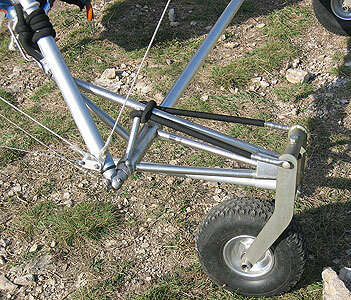 -The rigging is no problem and fast, an important point in the life as a tandem pilot.